Well the sun finally poked out between the clouds on Saturday and it was glorious! When the days are relentlessly grey, and wet, and cold, you almost forget what the sun looks like. So I wandered around the farm for an hour or so and just soaked the sun up on my back. After a few hours of sunshine I was ready to do some cooking and relaxing. Unfortunately our pantry was looking a little bare. Of course the staples were there, but there was none of the inspiring ingredients. Not many fruits or vegetables (the rain hasn’t been to great for our veg patch). I was wondering how on earth I could make an interesting dessert out of the two oranges left in the fruit bowl, when I glanced out the window and saw the rhubarb. Of course! 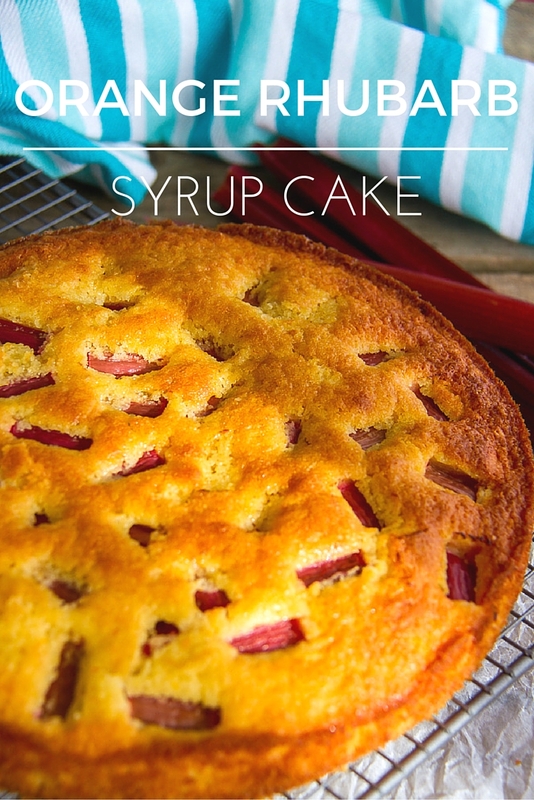 Rhubarb goes beautifully with orange, and it would add a fresh tang to a cake. I’ve talked before how rhubarb brings back childhood memories for me, yet I often forget that it is in our garden. What a shame! Look at those beautiful ruby red stems just begging to be cooked. Hannah took one look at the rhubarb I was cooking, and grabbed some more stems which she whacked in the microwave with a little vanilla and sugar and cooked for a few minutes. 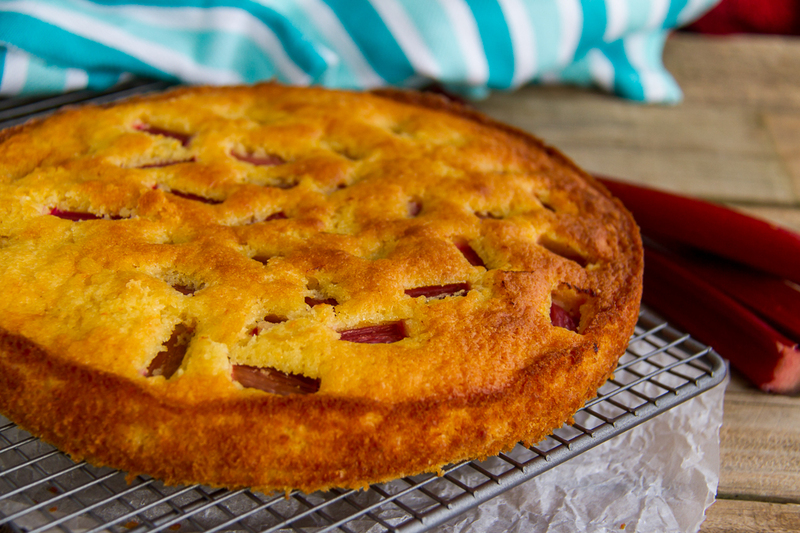 All three kids had stewed rhubarb for afternoon tea… while I had another slice of this delicious cake! 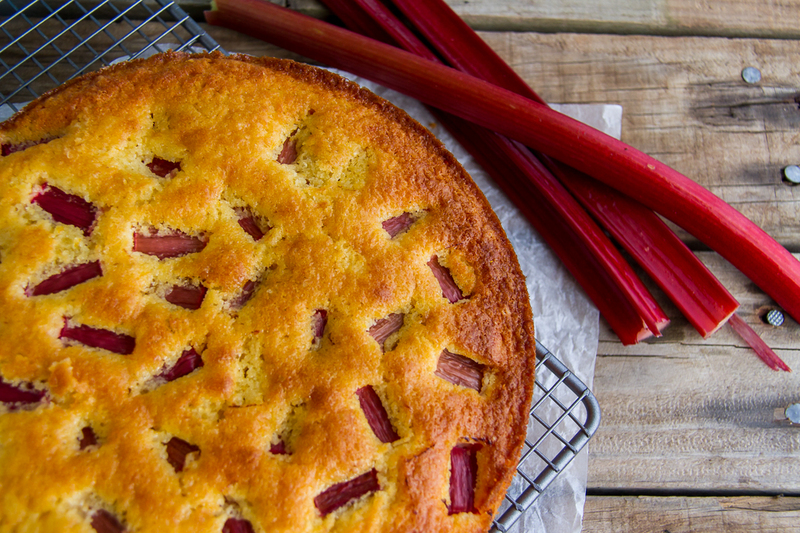 This week is meant to be wet and windy again, but I may pop out to the garden and grab a few more sticks of rhubarb to make another one of these delicious golden cakes that taste like the winter sun to me! Cream butter and sugar with the orange zest until light and fluffy. Use a metal spoon to fold through the flour, almond meal, and milk until all combined. Pour the cake batter into a greased and lined 20cm cake tin. Cut the rhubarb stems into 2cm lengths. Press the stems gently into the top of the cake batter. Bake at 180*c for approximately 35 minute or until the cake has cooked through. Combine the juice of the oranges with the remaining sugar, and water and slowly bring to the simmer, dissolving the sugar first. Simmer the syrup for 10 minutes until the mixture thickens slightly. Pour the syrup slowly over the cake allowing it to soak in fully. Do you have rhubarb growing? Did you get some sunshine over the weekend? Yummy. I prefer my rhubarb just plain, no other flavours added , but if push came to shove, rhubarb is still rhubarb. I like it especially cold with good cream. Good anyway, really.